In the summer of 1986, we first felt the “need for speed” and now, 25 years later, the lasting effects of the Top Gun summer are still evident in San Diego. As arguably the most successful movie ever filmed in San Diego, and one of very few filmed almost entirely in America’s Finest City, Top Gun has a special connection beyond just the excitement of seeing familiar locales in a Hollywood picture. As a military town, San Diego was the perfect choice for the film, not only because the screenwriters were inspired by a story they read about the Top Gun Academy in Miramar, but because of the support of the community while the film was produced. Although the Top Gun Academy has since given way to the Marine Corps at the Miramar site, the treasured legacy of the film survives for many locals. 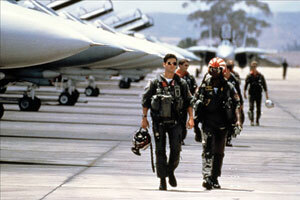 Top Gun was also responsible for an increase in applications to the US Navy. 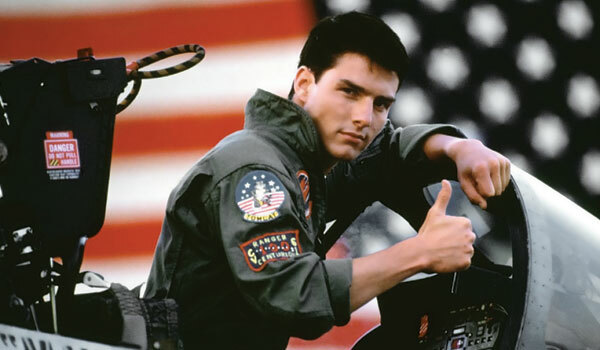 While its glamorized portrayal in the film is certainly an exaggera-tion of reality, Top Gun definitely made it look cool to be a fighter pilot. According to IMDB.com’s trivia page about the film, Navy recruiters set up booths outside major cinemas to catch the “adrenaline charged men leaving the theater.” They had the highest applications rate in years. At a more local level, the Top Gun legacy lives on. Many of the locations used in the film, while not entirely the same as they were in the mid ’80s, remain intact. The most prominent example is the “Top Gun House” in Oceanside, where the love scenes were filmed and where actress Kelly McGillis lived during shooting. 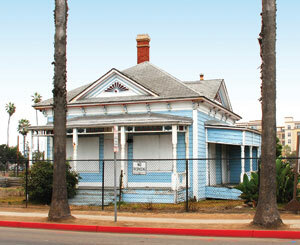 The house was built in 1887 and is the only property of four proposed homes designated for preservation amidst the construction of a $200 million beach resort in Oceanside, according to a SignOnSanDiego.com report. The house will be moved and incorporated into the resort in some way, possibly as a museum or gift shop. The house still attracts visitors from all over the world looking to view a piece of movie history. The Top Gun house in Oceanside, where the film’s love scenes were filmed, has been designated for historical preservation as part of a planned resort development. Located Downtown, Kansas City Barbeque housed the famous “Great Balls of Fire” scene — and was chosen after a chance encounter with the filmmakers. 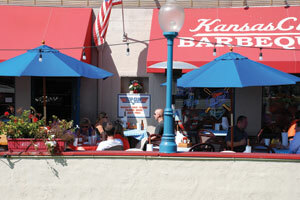 Of course, Kansas City Barbeque on 610 W. Market Street in the Gaslamp is the most well-known location of all. The scene where Goose and Maverick belt out “Great Balls of Fire” was filmed in the restaurant—on accident. Blair agreed and enshrined his establishment in film history. Unfortunately, a kitchen fire in 2008 burned down much of the interior, including all of the memorabilia on display. The restaurant has since been repaired and features less memorabilia than before, but still remains a top attraction for tourists and locals alike. Kansas City Barbeque is showing the film non-stop to celebrate the 25th anniversary. 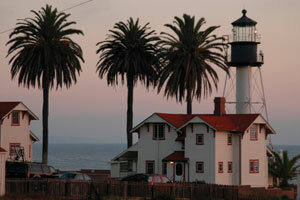 The Point Loma Coast Guard Lighthouse is where Maverick visits Viper (Tom Skerritt). Not open to the public, you can view it from certain spots near the Cabrillo Monument. Other locations used in the film include the Naval Training Center, now Liberty Station. When the movie was filmed, it was still where Navy recruits went through boot camp. At the intersection of West Laurel and Union in Banker’s Hill is where Charlie (McGillis) chases down Maverick (Cruise) in her Porsche and confronts him. Now closed, the Plunge indoor pool in Mission Beach is where the locker room scenes were filmed and where Iceman (Val Kilmer) performed his famous “bite” gesture. Finally, the Point Loma Coast Guard Lighthouse (not to be confused with the Cabrillo National Monument) is where Maverick visits Viper (Tom Skerritt) in one scene. Not open to the public, you can view it from certain spots near the Cabrillo monument. Other movies have been filmed in San Diego (Traffic, Almost Famous, Anchorman), but few have had lasting cultural impact or historical significance to the city. 25 years later, the film, and the city in which it takes place, can still take your breath away.